Can I list new vehicles on Marketplace? No. Dealerships can’t list new cars, only used and demo vehicles with approximately 800 kilometers and over can be listed. Will my listings also appear on the News Feed section of my Facebook page? No. Dealership listings will appear only on Marketplace, not on a Facebook page (unless deliberately shared to a page). Are Facebook users able to purchase a vehicle directly on Marketplace? No. Car purchases can’t be made directly on Marketplace. Marketplace just connects buyers and sellers. Dealership listings will appear with individual sellers’ listings on Marketplace, but buyers can filter between dealership or individual listings when they search for vehicles. What information or filters will my vehicles show on Facebook Marketplace? Shoppers can use a variety of filters such as price range, location, type, make, model year, mileage amongst others to filter vehicle listing on Marketplace. Can Facebook users see the listings from dealerships outside my PMA? By default, Marketplace shows listings within 60 kilometres of a person’s location. People can change this setting as needed when they search for vehicles. Can I use more than one data aggregator company to list my vehicles on Marketplace? For best results, dealerships should work with only one inventory partner. Working with more than one partner may result in fewer leads overall from Marketplace. What if I don’t have a Facebook Business page, can Dealer Solutions create one for me? Yes. We can create your Facebook business page so you can connect your inventory to Facebook Marketplace. You can contact our team by following this link: Request your Facebook page with us. When clicking on the link, you will be taken to a simple form to submit your contact details so a member of our team can call you back and discuss the next steps. How can I connect my inventory to Facebook Marketplace? To connect your inventory to Facebook Marketplace, you will require a Facebook business page setup. If you don’t have one setup, contact our team on 1300 661 133 for a quick quote, send us your request using the link below or visit facebook.com/business/pages/set-up for instructions on how to create one. Request your Facebook page with us. Once we have received your Facebook business page ID, we will send your inventory to Facebook Marketplace. Facebook will keep these inventory items hidden until Step 4 is completed. 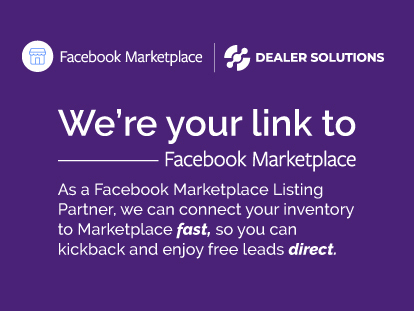 You’ll receive a Facebook notification on your Facebook business page informing you that Dealer Solutions is trying to send your stock to Facebook Marketplace. Accept this request and you can kickback and enjoy free leads from Facebook!